Media: Soft cover, 62 pages of text. Six profiles. Advantages: Italian and English text. Concise combination of history, modeling and camouflage. 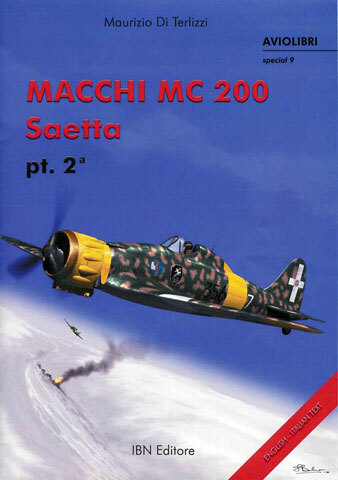 This is a most interesting volume as it is unabashedly a commercial “tie-in” with the new Pacific Coast Models’1/48 kit of the Macchi C.200 “Saetta” (“Lightning”). If I remember correctly, Mr. Di Terlizzi was a technical advisor on that kit. On the very first page the author states; “The Saetta on offer is a fine authentic model both for its shape and parts, which lend themselves well to an excellent piece of work.” I have not seen the kit, so I cannot comment on the author’s evaluation. But as a “tie-in”, this monograph is a nice introduction to the aircraft itself and a primer on building the model. The monograph is divided into three main sections. The first section, about 25 pages, deals with the operational history of the Saetta. While the coverage is a general overview, it is appropriate to this type of monograph, and points out the high points in the combat use of this aircraft. I still find it hard to believe that the Italian pilots flew the Saetta, with its open cockpit, in Russia in temperatures that would get down to 30 degrees below zero. They were clearly worthy of the phrase often used describe the pilots of the Regia Aeronautica: “Courage Alone”. The first section also includes a good number of photographs. One is particularly interesting, it is a close up of the bomb rack and bomb used on the aircraft in Russia. Another shows the dark circle (red?) which appeared on the outer gear doors of a number of Italian aircraft early in the war. The second part of the book, 14 pages, deals with the building of the Pacific Coast Models Macchi C.200 serie VII. The text is a well written “build article” that takes you through all the steps in building the kit, adding detail, and finally painting and applying the decals. Interestingly the author opted to use Vallejo Gloss Clear, rather than the usual Future. So if Future is unavailable in your country, an option is hopefully at hand. However, he does dip the windscreen in Future. The text is accompanied by pictures of the model under construction and pictures of the restored Macchi C.200 at Vigna di Valle Museum, near Rome. It is nice to see pictures of the completed cockpit sidewalls just above the pictures of the sidewalls of the restored Macchi. No doubt about it, Mr. Di Terlizzi produced one lovely model of the Macchi Saetta. The final section, 18 pages, discusses the camouflage schemes used on the Macchi Saetta. It is a very concise description of the early colors and the impact of the Table 10 Reform of 1941. Once again there are a number of good pictures to accompany the text. This section also includes a number of technical drawings and pictures. For those who want to do a bit of “extra detail”, there is a good “technical” picture of the two 12.7 mm Breda-Safat machine guns. The monograph concludes with a nice appendix. Mr. Di Terlizzi lists the full serial number of the Saetta’s produced, the quantity, the factory and serie and delivery dates. There is also a page of helpful modeling information. This includes the Italian camouflage colors, the FS approximation, and available paints from Gunze, Testors, Xtracolor, Aeromaster and Mr. Kit. There are also lists of a after-market detail parts and decals. Finally, the book is written in both Italian and English in parallel columns on each page. The English is a reasonably good translation, even if a little awkward at times. To be quite honest, if my birthday were coming up and I had an interest in doing this aircraft, I would drop a lot of hints that the model and this monograph would make a nice gift. As a free standing monograph, I am not sure it would be a primary, stand alone purchase. There are other more in depth monographs on the Macchi fighters, and on Italian camouflage. That being said, this monograph, combined with the kit would be a good way to start a modeler down that very seductive road of WW-2 Italian aircraft. Thanks to I.B.N. Instituto Bibliografico Napoleone for the review copy.